The Flexible Rainwater Storage Tank is an economical and flexible way to collect and store rainwater. When compared to other collection options, the flexible rain water tank has the unique advantage of having a low profile (25 to 5,000 gallons tanks are typically no more than 2 ft. in height). This has allowed them to sit under decks, under patios, in basements, and in other crawl spaces, keeping the tank safe and out of the way. 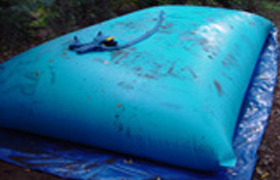 Flexible tanks can be used in a range of ways to collect and store rain water. One of the most common ways this tank has been used is through connection to a downspout. As water is gravity fed down the gutter, it flows directly into your tank through a hose that is connected to both the tank and the downspout. Located on the other side of the tank will be a second fitting. From this location, tanks can be connected to pumps that allow them to supply sprinklers, utilities, or other water supplies. To help filter out unwanted materials, a filter is often attached to the system before the hose to help prevent leaves or other items from clogging up the system. tanks can store anywhere from 5,000 to 210,000 gallons in a single unit! In addition to the rainwater collapsible tank, we also offer several plastic and steel rainwater collection units. Plastic Rainwater Collection Tanks are available for both underground storage (shown left) and above ground water storage. The underground cisterns feature FDA approved resins and ribbed exteriors for safe below ground storage. Steel Rain Water Collection Tanks are also available for underground rainwater collection. These rainwater storage tanks are often hooked up in a complete rainwater harvesting system that uses an underground steel tank, multi-media filter, and modular storage unit to collect, store, and reuse your rainwater. These systems can be setup and adjusted to meet your specific site requirements.